The samurai were a special class in Japanese society. These revered warriors were highly respected for their strict dedication to their craft, the immense discipline required of a samurai and their indomitable fighting spirit. To many they were heroes. Although samurai do not have any official status in today’s modern Japan, descendants of samurai families still enjoy a high esteem among the Japanese population and have remained an iconic symbol of courage, power, and masculinity for over 700 years of Japanese warfare history. Roads are an essential part of civilization. They help people travel and discover many different places. In Japan, during the Edo period the Tōkaidō (East Sea Road) was an important key artery for the ruling shogun dynasty to keep control over the country. Stretching along the Pacific Coast from Edo (Tokyo) to Osaka, two to three weeks on foot, was always an adventure. Does the Tokaido Road and the travelling life of a samurai sound exciting? 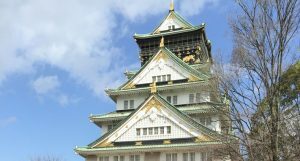 If so, join us on this unique tour for a taste of what these samurai experienced, our the 21st century version as we have included among all the favorites, a day at Universal Studios Japan, Ueno Zoo to see the panda bears and a day at Tokyo Disneyland! Round trip air via Delta Air Lines. Eight nights in first class hotel accommodations. In flight meals, breakfast daily at your hotel and 3 lunches. Final payment due by July 1, 2019. Package is non-refundable after this date. Baggage fee charges from the airline. Starting from $3,195 per person double or triple occupancy. Starting from $3,795 single occupancy. 10/05/19 – Depart Honolulu on Delta Air Lines flight 277 at 9:44 am and arrives in Kansai at 2:15 pm, 10/06. 10/14/19 – Depart Narita on Delta Air Lines flight 180 at 7:25 pm and arrive in Honolulu at 7:59 am (same day).